Registration is available online through ASSIST (Advanced Services for Student Information Supported by Technology). You can login to myUTRGV with your UTRGV username and password and click on the ASSIST icon under the Applications area. Students must officially register in ASSIST, by the close of registration to be eligible to receive credit for a course. Students will not be added to the official class rolls or grade sheets after the registration periods have ended. Per The Texas Higher Education Coordinating Board Rules and Regulations, students may not enroll in a course after the official census date (Ch. 9, Subchapter B, Sec. 9.31a). Students can begin registering for Summer 2019 classes based on their classification. Students can begin registering for Fall 2019 classes based on their classification. Fri, Mar 29 at 12:00 a.m.
Fri, Mar 29 at 9:00 a.m.
Mon, Apr 1 at 12:00 a.m.
Tue, Apr 2 at 12:00 a.m. Wed, Apr 3 at 12:00 a.m.
Thu, Apr 4 at 12:00 a.m.
*Students who qualify for early registration will be contacted via their UTRGV email addresses with a reminder of the registration date. ASSIST provides a variety of online services to UTRGV students regarding registration, financial aid, payment, and grades. For your security, ASSIST requires that you enter your username and password to access your financial aid, payment and transcript records. Registration is available to currently enrolled students and applicants who have been accepted for admission to UTRGV. Choose the class you are interested in and then click class search. This will give you different options regarding Time, Days, location, and Professor. After you have chosen the class you would like to attend, check off the box to the left of the class. Click HERE or the image below to watch a short video about Scheduler Planner features. 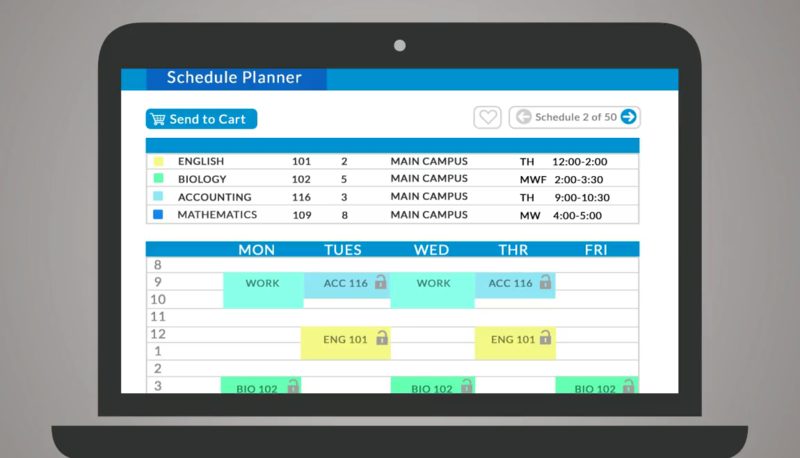 Scheduler Planner is a schedule planning tool which allows you to create and compare multiple class schedules for a given semester based on your course preferences as well as other commitments such as your work, sport and/or family schedules. Schedule Planner will generate every possible schedule for you so you can maximize your course sections and remain on track for a timely graduation. You can view up to four schedules side-by-side and compare options. After selecting your preferred schedule, you can import your schedule into your shopping cart. You can hold your class schedule in your shopping cart and add your classes when your enrollment appointment begins. Schedule Planner is available now! Log into ASSIST under my.UTRGV.edu and go to the Student Services tab and select Registration. You will see a link to Schedule Planner!